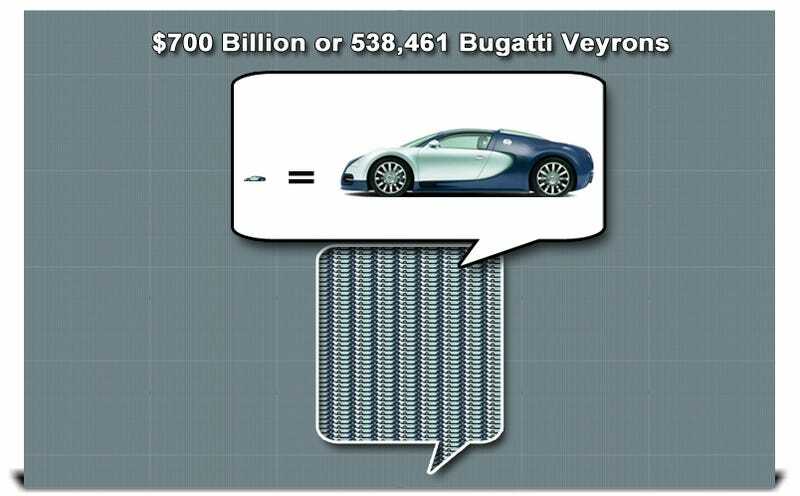 The Bailout In Perspective: How Many Bugatti Veyrons Is $700 Billion Dollars? The U.S. government TARP program's spending $700,000,000,000 of taxpayer dollars to bailout Wall Street and the not-so-Big Three. Let's put it into perspective. What would that look like in cars? Not only do 538,461 Bugatti Veyrons look impressive stacked up like an oil goon's plaything, but these stacks of Washingtons looks pretty impressive as well. The original creator decided to give us a bit of scale to judge the enormity of the money being spent and as you can see, that little car is absolutely dwarfed by (what looks like) a 30-story building of cold hard, taxpayer cash. Seeing the $700,000,000,000 TARP (Troubled Asset Relief Program) fund like this really pisses us off, so let's think of a better image. How about a mental image of Scrooge McDuck diving into his obnoxiously large gold coin vault. That would at least make us laugh.